For Steffani Zavala, participation in the 2016 Fuller Center Bicycle Adventure was only the beginning of her love of the organization. 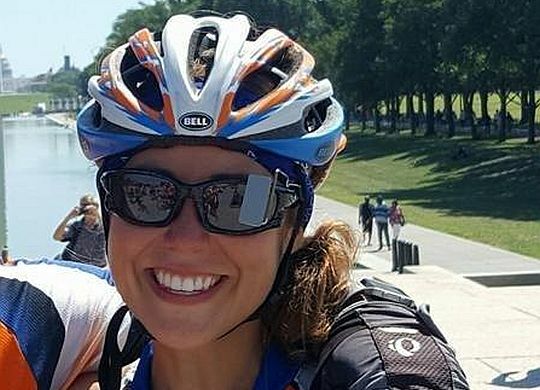 Alongside her husband Luke, Steffani rode her bike from Seattle, Wash., to Washington, D.C., to raise funds and awareness for The Fuller Center for Housing. Steffani first shared this interest with others when she decided to make homemade jewelry for her bridesmaids as a unique gift. When it came to taking this interest to the next level, Steffani was hesitant to begin selling her work. She was interested in the online marketplace known as Etsy, where anyone can sell their creations. Before taking the plunge, she had a few criteria: it had to feel right, be symbolic to a life experience, and benefit an organization she cared about. After her 2016 Bike Adventure experience, the Fuller Center was at the forefront of her mind. “When I realized that my jewelry restoration process could be a metaphor for the housing restoration projects that The Fuller Center does, I couldn’t get the idea out of my mind and started making pair after pair of earrings — more than 75 since being home from the trip, ending in August,” says Steffani of her post-adventure inspiration. “I only have about 25 or so listings on Etsy now, but I’m continuing to post them weekly, at least.” She said 75 percent of the proceeds are donated to The Fuller Center.